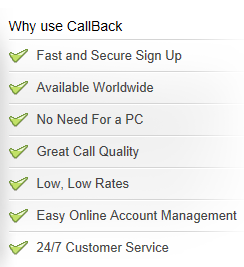 International Callback is a computerized system that re-routes international calls so that they are cost-rated as if the calls were originating from the USA. This benefits callers anywhere in the world because the U.S. has lower international telecom rates than most countries. The service has no set-up fee, no monthly fees, no minimum usage requirements, no taxes, and no VAT. There is no need to change your primary long distance or mobile provider. 1. 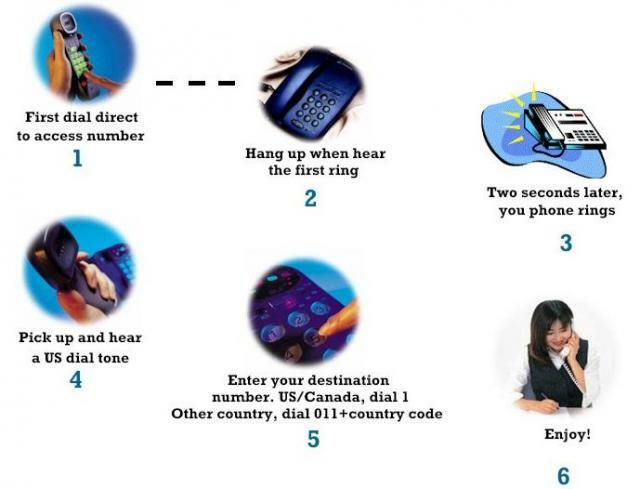 Dial the U.S. access number assigned to your account and hang-up after hearing the first ring (a free call). 2. Within a few seconds your registered international callback number will ring. It will be our “call back” computer asking you to enter the number you want to call. When you enter the phone number, your call will be processed immediately at our low rates instead of the local higher phone company rates. No special equipment is needed – just a normal touch tone phone or cell phone. Use the service from any touchtone phone. The callback service can be used from a fixed phone or a mobile phone to save when placing international long distance calls. Speed dial slots can be used for a faster connection to the most frequently dialed numbers. Make successive calls once the callback is received without having to re-dial the access number again. No taxes or VAT. Choose your payment option; we can debit your monthly usage from your preferred credit card or you can pre-pay your account every month. Receive a monthly statement by e-mail with complete call details. Access to an account management online feature for easy handling of many convenient features.